Lori Nix and Kathleen Gerber (previously) collaboratively produce detailed dioramas caught in the throes of natural or manmade chaos. From 2005 to 2015 the pair created a series titled The City, which imagined the post-apocalyptic interiors of abandoned violin shops, malls, and natural history museums. 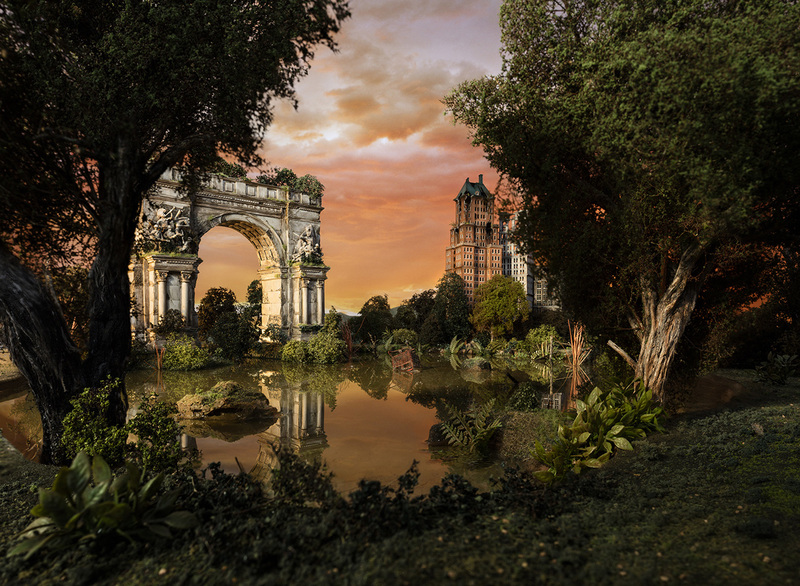 Empire, a follow-up suite of miniature scenes, serves as a companion to this series by looking at the same imagined future from an exterior point of view. Nix and Gerber’s new scenes move away from a focus on water-damaged and rusty interiors to explore broad outdoor environments recently devoid of civilization. Scaffolding and bridges crumble as plants begin to poke back through cement cracks, subtle hints that nature has begun to reclaim its land. Each labor intensive model can take up to 7 months to produce, which often means that Nix and Gerber will only finish two photographs a year. The handcrafted dioramas are built from cardboard, foam, and glue—impermanent supplies which are deconstructed and recycled after each shoot. The pair will exhibit images from Empire at their upcoming show at Chicago-based Catherine Edelman Gallery from March 2 to April 28. You can see more of their miniature scenes from both The City and Empire on their Instagram and Facebook.